If anything, major auto shows are exercises in overexposure. Right on schedule, throngs of international media descend on bright, stuffed convention centers to craft individual coverage of the latest and greatest on four wheels. Amidst all the gleaming concepts and world debuts, there’s a fair bit of automotive jetsam that isn’t necessarily noteworthy, aside from a curiosity factor. Here’s five little Easter eggs from the 2017 Los Angeles auto show. You’ve seen the Blue Oval’s new supercar on the road, on the track, on the cover of video games, and now, you’ve’ seen it bolted to a wall. 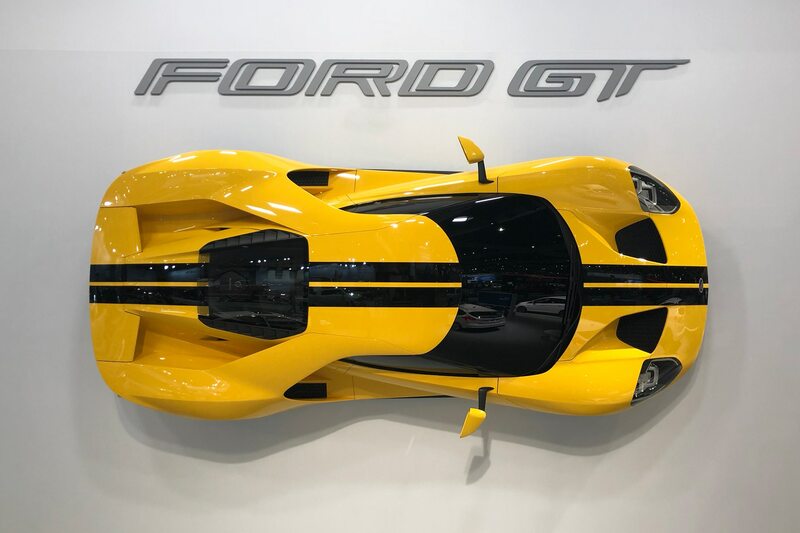 For no apparent reason other than looking neat, a Triple Yellow GT was nailed to the side of a showstand wall, giving us a rather gorgeous top-down look at the sculpted supercar. For good measure, they even constructed a viewing deck for visitors to get the best possible photo. 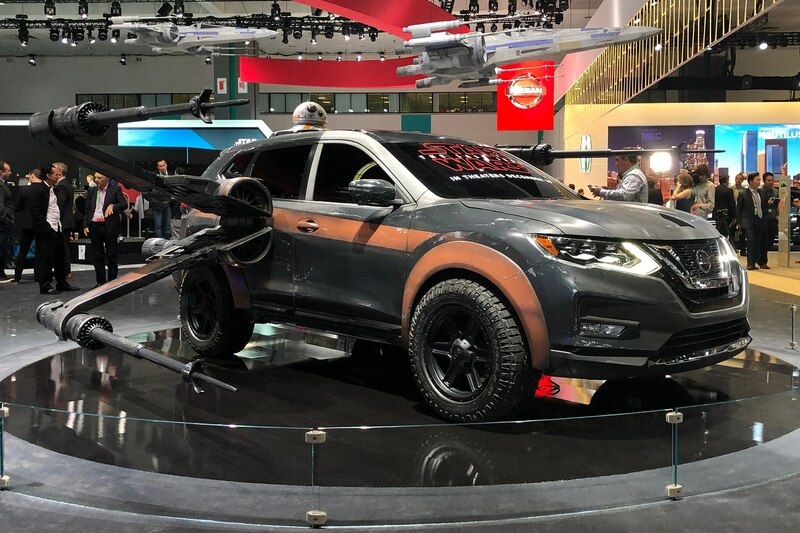 Following up on Nissan’s Star Wars-themed booth and special editions from last year, the Japanese automaker returned this year with a full salvo of vehicles mocked-up with Star Wars bits and bobs to celebrate the impending “Star Wars: The Last Jedi” later this month. In addition to this X-Wing Rogue, a Rogue Sport transformed into an A-Wing facsimile, an Altima donned TIE fighter regalia, and a 2018 Nissan Maxima emerged looking very much like Kylo Ren’s TIE Silencer. There’s more vehicles than we’re mentioning here, so get down to the show if you want to see the whole group. Confronted with a sea of black, white, and silver BMWs out in the real world, seeing BMW’s finest dressed in hues usually reserved for Skittles was a visual treat. The 4-Series Gran Coupe in eye-searing yellow was great, as was the copper i8 Roadster, but we were glued to the Techno Violet M4 on the stand floor. 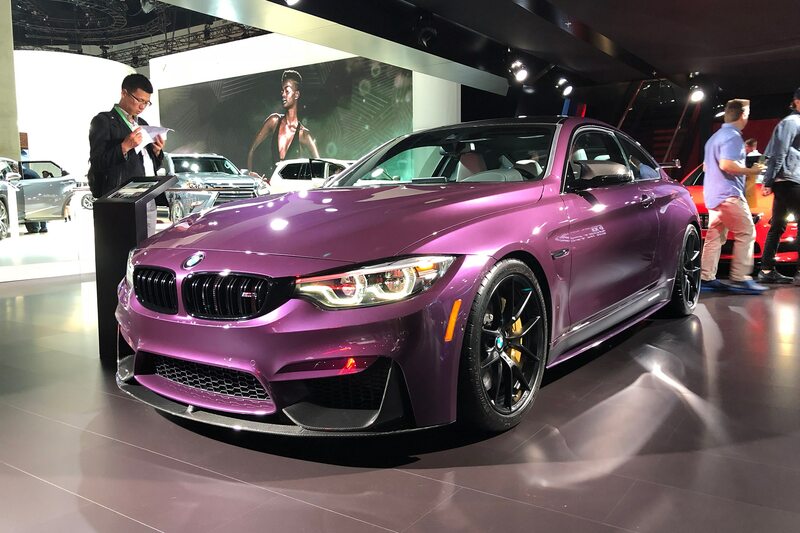 Covered in extra aerodynamic bits from the ever-growing M-Performance catalogue, this metallic purple paint won our hearts for the best color at the show. Don’t adjust your set – those proportions are exactly as “off” as they appear. Not content with corrupting its history with the new egregiously named Eclipse Cross, Mitsu teamed up with West Coast Customs for a strange showcar. 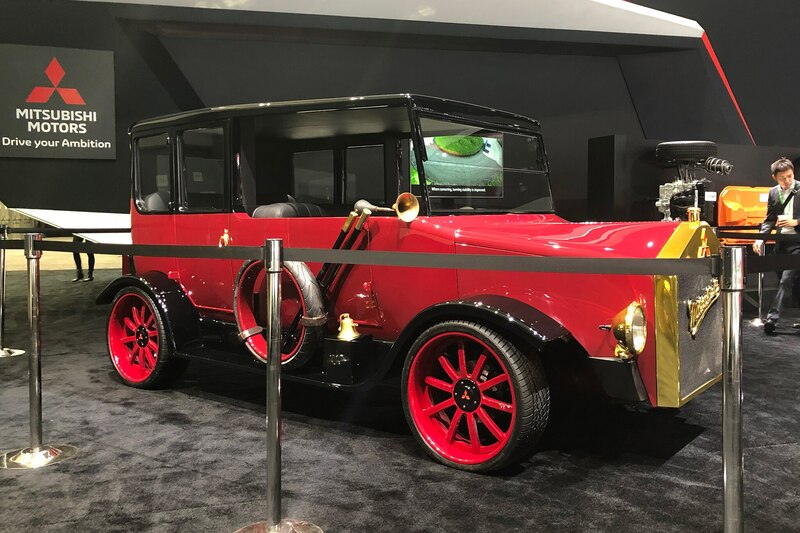 Starting with the drivetrain and platform yanked from an Outlander PHEV SUV, WCC chopped, cut, and banged-out a nouveau-retro body reminiscent of the 1917 Mitsubishi Model A. If the idea wasn’t strange enough, the resulting product is as weird as they come. Five-bolt wheels with that freakish-looking front schnozz call to mind the 1938 Mercedes-Benz L6500 Pritschenwagen we found at the Mercedes-Benz Museum in Stuttgart. From humble beginnings as a side project of a Japanese industrial complex to year-over-year sales records, Subaru has come a long, long way. At this year’s show, the Japanese automaker revealed its biggest moneymaker in the form of the new three-row Ascent SUV. 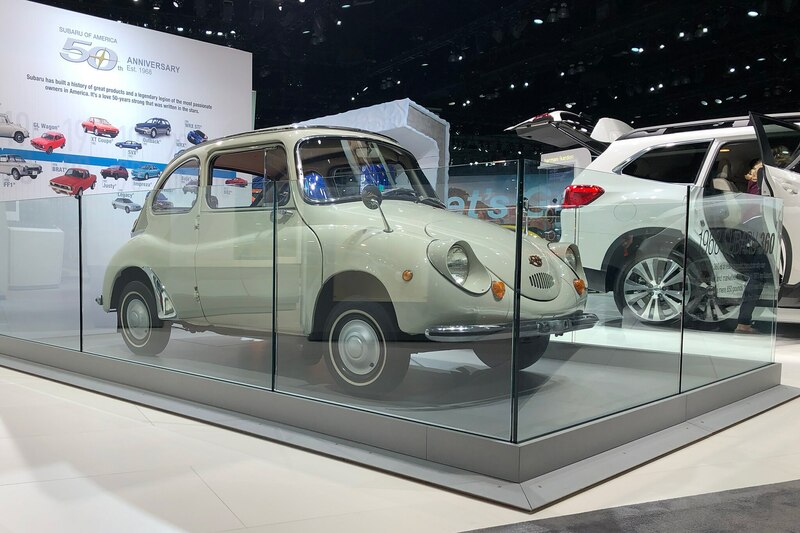 On the other end of the spectrum (and showfloor), an itty-bitty Subaru 360 hid behind glass railing, reminding us the Pleiades cluster hasn’t always graced overboosted rally cars and staid family sedans.